A heavy, reclaimed, cast iron swans nest fire basket / grill with forge made fire dogs. The basket has a traditional design with spiked finials and a deep area for burning. 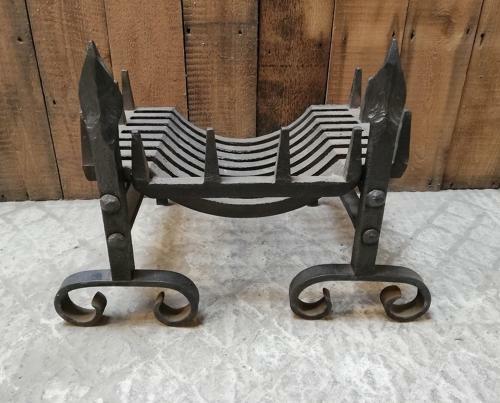 The fire basket sits on a pair of attractive, forge made, fire dogs with scrolled feet and spiked finials. One fire dog has the name "NETHERTON" cast in to the foot, referring to the Netherton foundry in Shropshire where they were made. The fire basket is in very good, solid and useable condition but does have some slight signs of use. The dogs have been blacked and polished but there is some slight tarnish and surface rust in areas. The underside of the basket has some surface rust. The grill has some signs of wear and use with slight tarnish and surface rust. There are some scratches and casting marks visible. A lovely fire basket that has a classic and attractive design to suit both period and modern interiors.